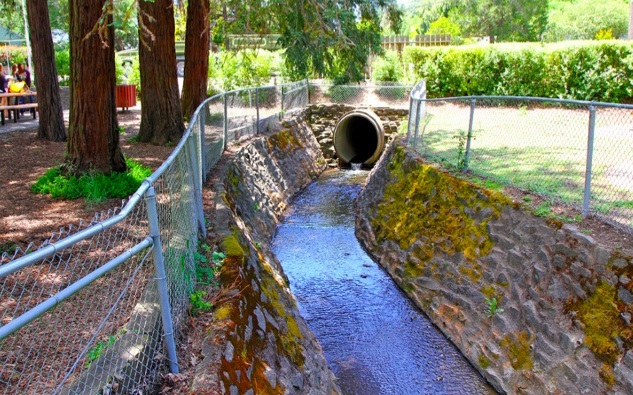 Calder Creek runs through an ugly culvert behind a chain-link fence in Ives Park in Sebastopol. Our proposal to the City is this: Daylight the creek from Ives Park to the Laguna. Plant a greenway along the Creek. Add an extension of the multi-use trail along Calder Creek to the park beneath Petaluma Ave. and Main Street. If the city-owned parking lot between Petaluma Ave. and Main Street is sold to a developer to construct first-floor commercial along with second story residential, some of the cost of daylighting the creek could be born by the developers. It would be an ideal location for both residents (close to the park, Laguna and business district) and business (near the commercial district). A greenway across the highway would be useful for attracting tourists to stop, dine and shop in Sebastopol. It can promote events in the park and the Sebastopol Center for the Arts. It could provide environmental education for students of the Charter School adjacent to the Creek. If you would like to help with this project, contact Rick Coates at rcoates@sonic.net.